International Journal of Research in Health Sciences,2015,3,1,134-139. 1,2-Associate Professor, Department of Pharmacology, Andhra Medical College, Visakhapatnam, A.P., INDIA. Multi Drug Resistant Tuberculosis (MDR TB) is resistant to Isoniazid (INH) and/or Rifampicin (R). Government of India started implementing Directly Observed Treatment, Short Course (DOTS) strategy under Revised National Tuberculosis Control Programme (RNTCP) since 1997, the country has come a long way. This study is undertaken to analyse the outcome results of MDR-Tb under PMDT. 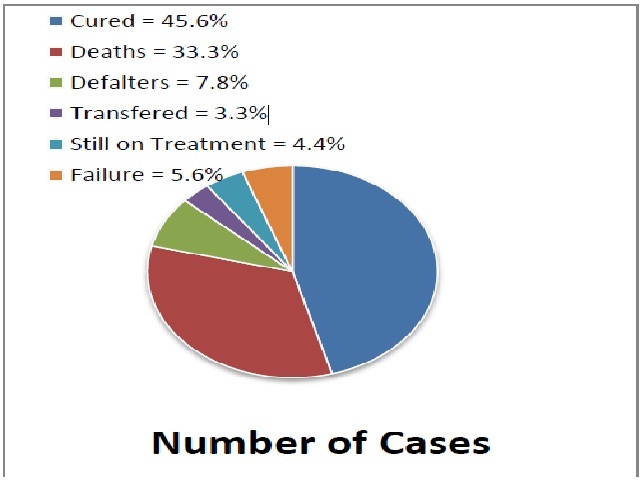 This is a retrospective analytical study of 90 patients who were registered in District Tuberculosis Control Centre (DTCC), Visakhapatnam during the period of January 2012 to December 2012. Observed results were, cure rate was 45.6%, defaulters were 7.8%, deaths were 33.3% and failures were 5.6%. Rapid diagnostics like Line Probe Assay (LPA) will reduce the time in MDR diagnosis and treatment. This will reduce the death rate in the long term. Default rate can be further reduced by intensifying health education, strengthening family support and improving nutritional status. Indira Kumari N 1, Syamala D 2 Original Article 1 & 2 - Associate Professor, Department of Pharmacology, Andhra Medical College, Visakhapatnam, A.P.